A new full complete edition of OST album for The Moon Embracing the Sun is releasing on March 22nd, 2012. The first OST album for The Moon that Embraces the Sun OST has been released mid February, but that version lacks one of the most popular song for the drama, the soundtrack by Kim Soo Hyun, “The One and Only You,” and other songs that released after the previous OST album was released. The newly released The Moon that Embraces the Sun Special Edition OST is including a CD as disc 1 with additional DVD as disc 2 which mainly contains music videos. 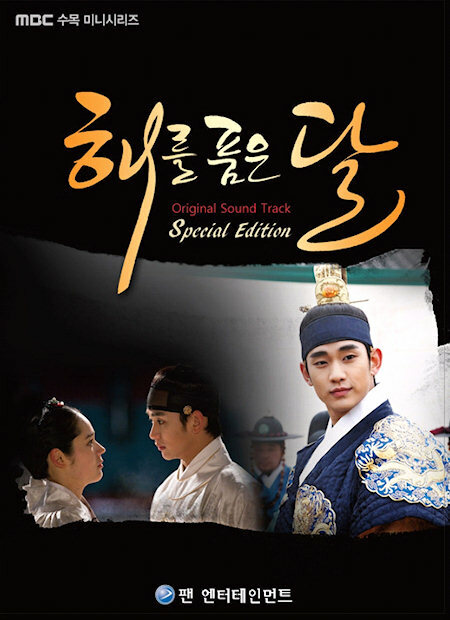 The Moon That Embraces the Sun Special Edition soundtrack features leading actor Kim Soo Hyun’s “You’re the Only One” and Lee Ki Chan’s “It’s Not”. Lyn’s touching theme song “Back to the Time”, Wheesung’s “Trail of Tears”, Monday Kiz’s “Shadow”, and He O.Ra’s “Under the Moonlight” are also on the track list, along with more score instrumentals not included in the previous OST to entice the audience. TMTETS Special Edition OST also includes a 36-page booklet and a DVD with four music videos, and bonus of never seen before still cuts. The Moon Embracing the Sun Special Edition OST is available at major music stores such as YesAsia (aff).